Weekday afternoons are always a stressful time for me. Between homework, football practice and dinner – well sometimes it’s all a big blur. I’ve really grown to love my Instant Pot for the efficient ways I can get dinner on the table for my hungry family in a quickness. Meals that are ready in less than thirty minutes are my jam, and if I can do it all in one pot, well then it’s my favorite! October is National Pork month, and I already have quite a few recipes that are my go-to for pork chops or shredded pork sliders. However, sometimes everyone is in the mood for a meat and potatoes kind of meal, and this is just that! 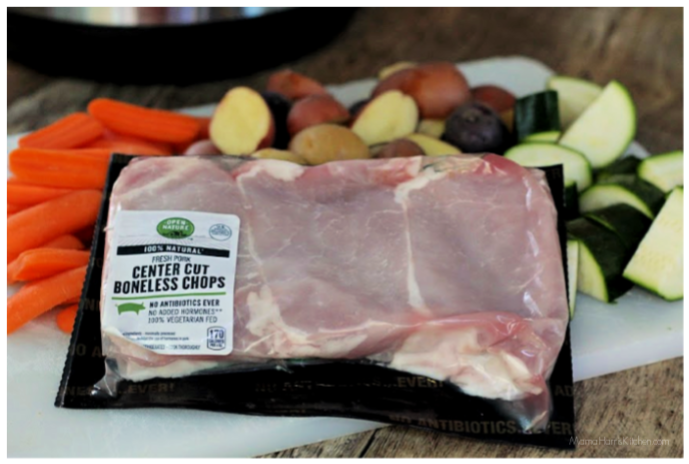 I decided on boneless pork chops because of the quick cooking time, PLUS this is a super affordable meal in addition to being tasty and filling. SCORE! All Open Nature pork is of the Duroc heritage breed. Duroc is esteemed by chefs for its high-degree of marbling, which translates into a more tender, juicy, and flavorful eating experience. Duroc makes it “fool-proof” to prepare a delicious entree. Open Nature pork is antibiotic free (no antibiotics, ever), is 100% vegetarian fed, has no added hormones or growth promotants and is raised crate free. These are qualities that keep me coming back to this brand every time. Not just for the pork either! There’s a wide variety of products in both food and non-food categories with over 400 items! Open Nature products are high-quality, clean label products at a value when compared to national brands. They’re dedicated to a clean lifestyle, free from 110 food ingredients, and meat products are 100% natural meat. The chicken and pork are 100% vegetarian fed, with no antibiotics ever. The beef and lamb are 100% grass fed and raised without antibiotics. I love that the brand is not only ethical, but affordable and easily accessible. It was important for me to create a simple dish that is flavorful with minimal ingredients. Of course adding pops of color like red and blue potatoes, carrots and zucchini makes my heart sing too. This is a hearty Fall meal that is a cinch to put together, and will fill your home quickly with delicious smells! The potatoes and carrots then get added to a bowl with the cut up zucchini, add some more oil and lots of flavor with the spices and seasonings before starting in on the pork chops. Both the veggies and pork are seasoned with some of my favorite go-to flavors like smoked paprika and herbs to both, then some lemon pepper, garlic salt and brown sugar to the pork. Don’t be afraid of a little flavor! The pork chops also get sauteed in grapeseed oil with a bit of butter, just browning each side to really lock in the flavor before it’s cooked on high pressure in the instant pot. A quick 2 minutes on each side is really all it needs! Add a bit of chicken broth and minced garlic before folding the veggies up in foil packs ( I used 3 packs of foil) and placed on top of the pork before cooking for six minutes in the instant pot. For this meal a quick release is used to get it out right away. *Optional: create a slurry with a bit of corn starch and water to mix in with the remaining juices once the pork chops are taken out. Plate your chops and serve with the veggies for a hearty, tasty weeknight meal that’s ready in just under 30 minutes. Enjoy! This instant pot spice-rubbed pork chops with veggies dinner is ready in just under 30 minutes! Perfect for the busy weeknights in the Fall Season. Begin by pressing the saute button on your instant pot. Add 1 tablespoon of grapeseed oil and allow to heat up. Add the halved potatoes, and lightly saute them while stirring occasionally to prevent sticking. After 2-3 minutes, add the halved carrots. Continue to saute the potatoes and carrots for about 2 minutes. While they are sauteeing, add ½ tablespoon grapeseed oil to a medium bowl with all of the seasonings for the veggies. Press the power button to turn the Instant Pot off, then add to the bowl with the seasonings. Stir together until well combined, adding the cut zucchini as well. Set aside. Power the Instant Pot on again with the saute button, adding the butter and the grapeseed oil. Season both sides of the pork chops with the garlic salt, lemon pepper, smoked paprika, dried basil, and brown sugar. Add to the instant pot and brown each side of the pork chops, about 2-3 minutes per side. Once the second side is browned, top with minced garlic and pour the chicken broth over the top. Wrap the seasoned and oiled veggies loosely in aluminum foil wraps, and place the basket that come with the instant pot on top of the chops, topping the basket with the wrapped veggies. Press power on the instant pot, then set for 6 minutes at high pressure. Cover and make sure the steam release button is closed. Once done, do a quick release to let the steam out, then remove the cover on the instant pot. Carefully remove the foil packets and open them into a serving dish. Also remove the wire basket, and carefully remove the chops and add them to a serving dish as well. It's optional to make a gravy with the remaining juice, just make a slurry with cornstarch and water and stir it into the remaining juice until it's a little thinner than the consistency you'd like. Top the pork chops with the gravy. What is your favorite cut of pork? I buy my Open Nature® Pork at my local Safeway, and you can also find them exclusively at all of the Albertsons Companies Family of Stores, including Albertsons, Safeway, ACME Markets, Jewel-Osco, Vons, Pavillions, Randalls, Tom Thumb, Shaw’s, Star Market and Carrs/Safeway. Visit Safeway.com to find a store near you and discover more recipe ideas. This sounds fabulous! I love that overhead shot of the raw ingredients in the pot. Nice job and kids friendly too.